Yoga is a mind and body practice with historical origins in ancient Indian philosophy. 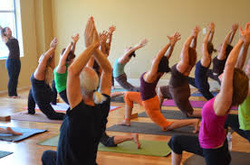 Like other meditative movement practices used for health purposes, various styles of yoga typically combine physical postures, breathing techniques, and meditation or relaxation. There are numerous styles of yoga. Many people who practice yoga do so to maintain their health and well-being, improve physical fitness, relieve stress, and enhance quality of life. In addition, they may be addressing specific health conditions, such as back pain, neck pain, arthritis, and anxiety. Yoga means “union,” and through practice one strives to construct and strengthen the union between mind and body, using breath and a variety of postures. One can build strength, gain flexibility, rehabilitate an injury, obtain peace, work toward weight loss and most of all have fun doing it. Yoga is for everyone and anyone, from the young to the old. It’s not necessary to be “fit” or “flexible” to start practice. Yoga can fit into any lifestyle or religion; no particular set of beliefs is needed to strengthen your mind and body. The Abiding Spirit Center offers a variety of yoga workshops throughout the year, taught by certified instructors from a variety of experiences and backgrounds. Please check our Seminars & Special Activities section on our Home Page for upcoming classes.